Brilon fits well into the network of the German railway (Deutsche Bahn). It only takes a few minutes on foot from the station 'Brilon Stadt' to the marketplace (starting point of the hiking trail). Brilon is accessible from all directions. From the West: A1, A44, A445/A46 and the federal highway B7 to Brilon. From the North: A2, A33 and the federal highway B480 to Brilon. From the East: A44 and the federal highway B7. From the South: A44 and the federal highway B7 to Brilon. The nearest airport is the international airport of Paderborn/Lippstadt (40 km north of Brilon). The express bus line S60 and the line 460 operate between the Paderborn main train station and the terminal at the airport. From there take the bus S80 direction 'Brilon Markt' and exit at 'Brion Stadt'. The Briloner Kammweg has been certified as a quality way "Walkable Germany" (Wanderbares Deutschland). Hoppernkopf (800 m) and Hoher Eimberg (796 m) are the topographical highlights. The Briloner Kammweg as well as the Rothaarsteig, have their starting point at the market square in Brilon. Beautiful timber-frame houses in the Westphalian style, the town hall with its Baroque facade and the gothic-massive tower of the Church of St. Petrus and Andreas (Propsteikirche St. Petrus und Andreas) form the framework for the first few kilometres out of town. A stroll through Brilons's lovely old town is the perfect start for the following hiking. The hiking trail can be well accomplished in three stages. For those who want to enjoy the hike without heavy backpacks or suitcases a luggage transfer and accommodation can be easily arranged by the Brilon tourist information: Derkere Str. 10a, 59929 Brilon. Simply enjoy unspoiled nature at it´s finest. The detour leads hikers to the nearby Bruchhausen rocks (Bruchhauser Steine) - four huge, up to 90 m tall porphyry rocks. The highest rock is named Bornstein and is about 92 m high. The forests in this area seem endless. Brilon is not for nothing the municipality with the largest forest stands in Germany. Brilon in the Hochsauerland is recognized as Kneipp spa town (Kneipp-Kurort) since 2000. The spa park on the river 'Helle' offers several water areas with rest and sunbathing facilities and a Kneipp facility, the water of which comes from the nearby Möhnequelle. Not far away from Brilon lies 'Fort Fun' (30 minutes), a Western styled leisure park for the whole family. One of the attractions is the Alpine Coaster 'Trapper Slider', a summer toboggan run (Sommerrodelbahn) on rails. 'Fort Fun' offers the opportunity to stay right next to the park in a wooden huts camp with 25 huts. Kurpark Villa Aslan in the quiet town of Olsberg features free WiFi, a large spa with a range of saunas and a beauty studio. The Avocado restaurant serves light, gourmet cuisine and a fine selection of wines. This hotel in Brilon is located in the pedestrian area, just off the historic market square. 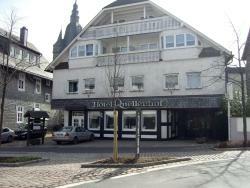 The Quellenhof features a rustic-style restaurant serving a buffet breakfast and regional German cuisine. Offering free WiFi in all areas, Hotel am Wallgraben is a restored Wilhelminian-style building in the historic centre of Brilon. 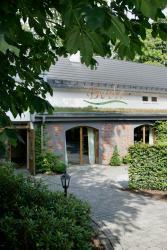 It features an elegant restaurant, a traditional beer garden and modern rooms with a flat-screen TV.